COCKHILL Celtic player/boss, Gavin Cullen believes his side can take lots of encouragement from their FAI Cup first round defeat to Premier Division outfit, Limerick at the Charlie O’Donnell Sports Grounds. Given the Ulster Senior League outfit were without several first team players and had just began their pre-season campaign, it was a brave effort against an almost full strength Limerick. And the Inishowen club would’ve been full value for a half-time lead and really should’ve been in front on five minutes but Gerard ‘Jazza’ McLaughlin screwed his shot agonisingly wide. Cullen admits he could’ve done better to keep out Limerick’s opener when Killian Brouder’s 30 yard strike beat him low to his right three minutes after the interval. Having matched Limerick up until that point, it was a sucker blow and one which knocked the fight out of the amateur league club. Limerick may be experiencing their fair share of problems both on and off the pitch this season but they boasted enough quality, experience and superior fitness levels to wrap up this cup tie. Cockhill Celtic's experienced midfielder, Gerry Gill wins this race for the ball ahead of Limerick player Colm Walsh-O'Loghlen at the Charlie O'Donnell Sports Grounds. Cullen produced a string of saves in the dying embers of the game but he could do nothing about Limerick’s second goal on 74 minutes when Barry Maguire slotted clinically into the net. That signalled the end of Cockhill’s FAI Cup for 2018 but Cullen felt his side did the Ulster Senior League proud. “We’re only two weeks into pre-season and Limerick are 26 or 27 games into their league and they’re full-time so there’s going to be a difference in the fitness levels,” said Cullen. “I felt for 50 odd minutes it was pretty even and we probably created the best chances in the first half and were disappointed not to go in 1-0 up. “Goals change games and they got the first one. I should’ve done better myself - it was a long range strike that I misjudged and that was the killer,” he admitted. So no arguments about the final score but Cullen agreed it could’ve been a totally different encounter had ‘Jazza’ McLaughlin netted that early chance. “It was a great chance and I’d say if it was a few weeks into the season he would’ve sorted the legs out a but better and would’ve finished that,” continued the former Institute and Finn Harps goalkeeper. “Mistakes like that happen in pre-season and it’s a pity he didn’t get it because we would’ve had something to hold on to and you would’ve seen a different effort in the second half. 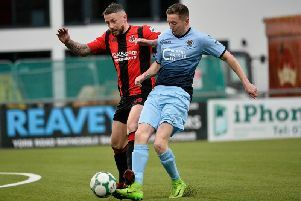 Meanwhile, Cullen felt his side were never in danger of doing a Blarney United and falling victim to an embarrassing defeat to Premier Division opposition in the FAI Cup. The Cockhill Celtic player/manager was confident his side could do the Ulster Senior League justice and show they can compete with Limerick if they could keep their discipline at the Charlie O’Donnell Sports Grounds on Sunday. The previous day Munster League side, Blarney United were blown away by a rampant Derry City who secured a record-breaking 12-2 win at O’Shea Park. However, Cullen was confident his side would stand up to the challenge from Limerick despite being in the infant stages of their pre-season campaign. "You look at the Blarney game against Derry,” he said. “Blarney came from the same level as ourselves and it was 12-2 but that was never going to happen with us. “We were confident with our own discipline and shape and ability to make sure that wasn’t going to happen. “I think this is the 13th or 14th League of Ireland team we’ve played in either the FAI Cup or EA Sports Cup and it’s always the odd goal or a fine line which proved the difference. It’s just that next step that these lads possibly have it in them but it’s very difficult when you’re an amateur set-up and people work and are on holidays,” he added.